High quality food processing machinery plays a vital role in assuring optimum results to yield hygienic food with the desired taste, crispiness, etc. 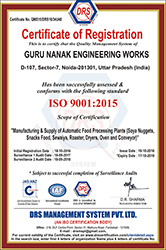 Guru Nanak Engineering Works has been catering successfully to the food processing machinery needs of the market since its establishment in the year 1982 in Noida. We are engaged as a leading and an eminent manufacturer, supplier and exporter of Food Processing Machinery like Roasters, Ovens, Soya Nugget Extruder, Machinery for Noodles machines, snacks food machine, Dryers, Pasta Making Machine, Corn Flakes Making Machine, etc. Ever since our inception, our motto has been to deliver unsurpassed food machinery to our eminent customers at attractive price ranges. Since last 25 years, we have been catering to the needs of hotels, restaurants and other sectors. Under the guidance of our founder, Mr. Sardar Asa Singh, we have achieved heights of success in a very short period of time. This has led to the fame and goodwill of our company in the domestic as well international markets like Gulf countries, China, Nepal, Bhutan and Africa. Being a customer oriented company, we are known to provide services with a personal as well as professional touch. We believe in strengthening the relationship with our prestigious clients to understand and meet effectively their requirements.